Major League Baseball’s spring training camps are getting ready to open and if all goes according to plan for the Yankees in Tampa, Florida during the next six weeks, Amsterdam native Didi Gregorius will succeed the great Derek Jeter as the Yankee’s next starting shortstop. 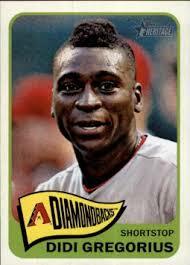 Look at his baseball card pictured here. The guy’s even honoring our area by wearing a Mohawk-style haircut! Didi, whose real first name is Mariekson, was acquired by New York this winter as part of a three team trade. He was born in Amsterdam on this date in 1990. The only problem is that it was Amsterdam, Netherlands and not New York. We could not find an Amsterdam, NY born Amsterdam Birthday Celebrant for February 18th so we’re taking today off. Oh, one very important thing is happening for the first time in Amsterdam, NY today. Liberty Fresh Market is now serving sandwiches and wraps. Amsterdam’s newest store already sells the best fresh baked breads in town, delicious John Martin deli meats and a line of Jake & Amos flavored mustards that fly off the shelf. Culinary magic happens when you put these three things together and as of today the Market’s deli staff will do it for you. You can get your favorite sandwich or wrap with a fresh dill from their pickle barrel to go or to eat right there in the market’s new bistro. They also serve a meatless sandwich or wrap with fresh, locally made goat cheese that will knock your socks off, even if those sox happen to be red. Click here for the Market’s full sandwich menu. Phone in orders are accepted, call 212-6758. The Market is open today from 10am to 6pm. We will be back tomorrow with an Amsterdam Birthday Blog celebrant actually born in Amsterdam, NY! I would like to receive the Amsterdam Birthday Blog trivia questions via e-mail whenever there's a new post. Nominate individual(s) you think should be recognized by this blog. Include birth date(s) and reason(s) why you are making this nomination.